The Raving Queen: "Hummingbird , Don't Fly Away, Fly Away!!!!!!!!!!!!!!!!!!!" "Hummingbird , Don't Fly Away, Fly Away!!!!!!!!!!!!!!!!!!!" Darlings, whether it was subconsciously to honor Paula Deen or not, I cannot tell you, but last night, due to the heat, Monsieur and I had a Simply Southern Supper. 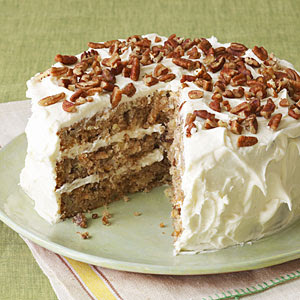 We started with Chicken, Macaroni Salad, and Cole Slaw, and topped it off with Hummingbird Cake, which is a Southern delicacy, that is an acquired taste! It is a mild spice cake, made with bananas, pineapples, and cream cheese frosting! I bet Paula has baked a few in her time! Honestly, by dinner's end, I felt like the Belle Of The Ball! 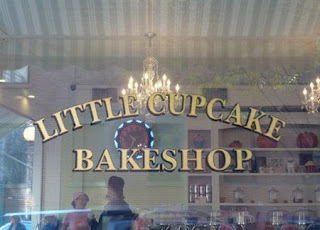 We got OUR Hummingbird Cake at the Little Cupcake Bakeshop, on 91st Street and Third Avenue, in our nabe. If you are near there, and want Southern, darlings, go there! They have Red Velvet, Ice Box, and Coconut Cloud Cake!!!! I cannot wait to try the last!!!!!!!!!!!!!! I just finished the Hummingbird slice, and I am on SUCH a Southern sugar high, right now! Love to all my girls!!!!!!!!!!! The South will rise again, darlings!!!!!!!!!! Especially in the kitchen!!!!!!!!!!!!!!!!!!! !